We begin the journey in the morning departing from the Geneva airport by private car for the drive over the mountains to the charming town of Arbois. 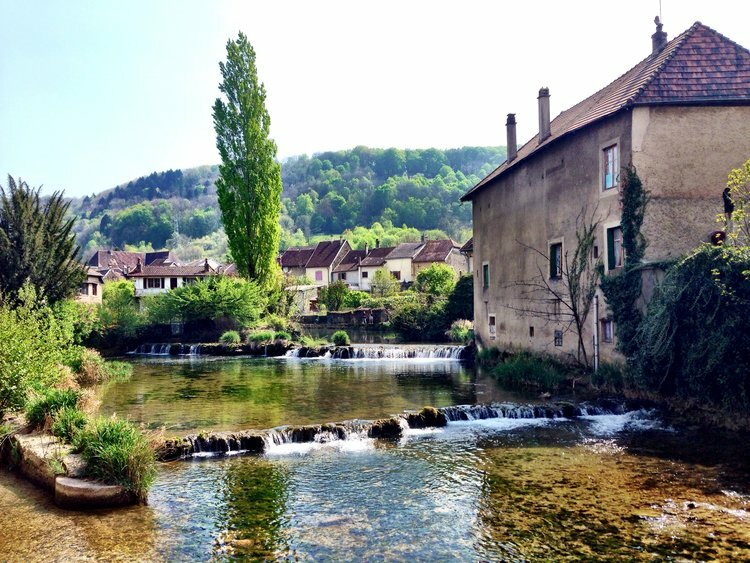 This ville in the heart of the French Jura is the site of Neal’s small, intimate hotel, La Closerie les Capucines, our home for two days. A moment to refresh and repose after arrival, a light lunch at a local bistro or perhaps at La Closerie itself, then begins a deep dive into the wines and tradition of the Jura with a tasting at one of the many wineries with which Neal works in the region. Dinner at the Michelin 2-starred Maison Jeunet will place an exclamation point on the first day. Arbois, the Jura. The River Cuisance flows past 16th-century stone buildings some with 12th century cellars. After a luxurious breakfast at La Closerie, we set out for Pupillin and the cellars of Mickaël Crinquand for a tasting of his famed wines created from the Ploussard grape (Pupillin being the acknowledged home of this scarce, local variety) and other pleasures of the Crinquand cellar. A short drive follows to visit the famed cheese affineur, Marcel Petite, recognized the world over for the Comté he produces. An elaborate cheese tasting...otherwise known as “lunch”... will provide a moment to relax. Later in the day, we will visit Domaine Montbourgeau, the estate of Nicole Deriaux, whose wines from L’Etoile have surprised and dazzled those most knowledgeable about wine. Dinner at Chateau de Germigny, with its cutting edge cuisine and its fine wine list, closes our time in the Jura. The morning begins with a short drive to the Cote d’Or where we will taste first with one of Neal’s fine producers in the Cote de Nuits; lunch at La Cabotte in Nuits Saint Georges in the company of another of Neal’s growers will follow. The afternoon will continue our exploration of the Burgundian landscape with another cellar encounter ... this time in the Cote de Beaune. A relaxing, short drive in our private car will take us to the Auberge du Paradis, a romantic retreat in the heart of the Beaujolais district. Cyril and Valerie, proprietors, will greet us in their chic inn and we will dine on Cyril’s masterful and creative cooking — a one-star Michelin table that will surprise and haunt. There is never enough fine Burgundy to taste, so we will start the day with a return visit to the Cote de Beaune for a tasting and a lunch with one of Neal’s growers. A final cellar visit completes the afternoon before returning to the Auberge du Paradis. Dinner will be at any of a number of outstanding bistros that dot the landscape of the visually stunning Beaujolais and Maconnais hamlets. Ghislaine Barthod, Domaine Ghislaine Barthod, Chambolle-Musigny, Côte Nuits, Burgundy. It will be difficult to depart Auberge du Paradis, particularly after having indulged in one of the finest breakfasts available anywhere — but our visit to the vineyards and a tasting of the wines of Domaine Cheveau in the village of Pouilly will enhance our understanding and appreciation of the grandeur of Burgundy. Lunch at Courtille de Solutré will provide renewed energy to tackle the excitement of the city of Lyon, our next stop. Lodging at the gorgeous Cour des Loges, we will spend the evening at one of the fine theatres in this lovely city, perhaps the “Celestin Theatre de Lyon”. A light dinner or perhaps a larger dining indulgence will be the day’s “dessert”. The last day before departure will be busy and beautiful. We might start with a visit to the Musée des Beaux Arts; then, we will gather our belongings and drive to Lac du Bourget and the restaurant Lamartine with its fine table and achingly lovely view over this enchanting lake. Perhaps one of Neal’s producers in the Savoie will join us for a leisurely lunch before we head off for Geneva where we will spend the last night at Les Armures, a fine hotel in the old part of the city. An evening boat ride on Lac Leman with a break for dinner at the Auberge de Dully, one of the best-kept secrets for a fun evening of food and wine, will close out our pilgrimage. On this final day together, we will have a leisurely morning with a robust breakfast at Les Armures — perhaps while sitting on the square in the shadow of the Cathédrale de St. Pierre. Then will come our short jaunt by private car to the Geneva Airport for the return home. Carema, where Italy borders Switzerland and France, home to vineyards on steeply terraced land and known as a wine growing area for two thousand years. The voyage begins at the Milan Malpensa airport in the morning. A private car awaits to make the short trip (45 minutes) to Lago Orta. There will be time to recover and refresh at the lakeside hotel and have a light lunch in town at La Motta overlooking the lake. The afternoon is dedicated to an initiation into the magic of the wines of Alto Piemonte with a tasting and vineyard visit with one of Neal's team of dynamic vignaioli, perhaps Massimo Clerico in Lessona or the Conti sisters in Maggiora who produce a fine Boca. Dinner will further immerse us in the traditions of the Alto Piemonte as Gianluca and Raffaella of the agriturismo, La Capuccina, will cook their farm-raised produce for us before we return to Villa Crespi to recharge for the coming days. A morning private boat ride to enjoy the natural splendors of Lago Maggiore will include a visit to the renowned cheese affineur, Eros Buratti, with a lunch table set with the finest cheeses and other produce sourced from local farms. Then, Antonello Rovellotti and his family will open the doors to their cantina in the historic town of Ghemme at the center of which is the "ricetto", a walled compound that served as a refuge for people of the area during times of strife and war. This tenth century citadel of 12,000 square meters eventually evolved into a communal storehouse for the agricultural products native to the area — with most of the surface dedicated to wine. It is there that much of the work of producing the Rovellotti wines takes place, The evening will be dedicated to dinner at the hotel, Villa Crespi, recognized as the finest table in the region. The day begins by traversing the border between the Alto Piemonte and the rarely visited but quietly beautiful Canavese district in northwestern Piedmont. There we will spend time with Andrea Bianco, beekeeper extraordinaire and Neal's long-time friend and supplier. We will taste a stunning variety of flower-specific, vintage-dated honeys and, if the weather and timing are right, we will be witness to the release of the bees to work the flowering trees and herbs in the Parco Nazionale di Gran Paradiso. To match the bees' hunger, lunch will follow at Ramo Verde, a rustic trattoria in Carema, home to the rare wine of the same name. Lunch-time companions will be Roberto and Andrea Ferrando, masters of Carema, the most noble version of Nebbiolo. A hike in Neal's steeply terraced vineyards in the shadow of Monte Bianco will end the day's activities and prepare us for settling into the lovely Auberge de la Maison in the village of Entreves, the final outpost in Italy immediately below the summit of Mont Blanc and at the edge of the frontier with France. We will begin the day on the funicular to the summit of Mont Blanc, providing us with spectacular views of this heavenly place. At 15,781 feet, it is the highest mountain in Europe and the roof of the old Continent. We will then descend for a tasting with an- other of Neal's growers, Ermes Pavese, with whom we will have a delightful lunch as we get to know his exceptional Blanc de Morgex, wine produced from some of the highest altitude vineyards in the world. The late afternoon will provide time to indulge at the spa at Auberge de la Maison or perhaps enjoy the thermal baths in the neighboring village of Pré St. Dider. Dinner at Dandelion, a local and delicious neighborhood trattoria will conclude this day. We leave the high mountains and on our descent to Torino, we will first stop in the village of Arvier to visit with Danilo Thomain, the producer of the sole estate-bottled "Enfer d'Arvier", a rustic red wine of mythic dimensions. A pass through the terraced vine- yards that sit exposed to the sun all year long will imprint this wine on your soul. The wine tour of the Valle d'Aosta will conclude with a stop in Ollignan, perched high above the town of Aosta, where the Grosjean family will receive us and then present the full range of their organically produced red and white wines that have made this family famous. A light lunch (is that possible here in the high mountain passes where the rough conditions foster hunger? We shall see...) will break up the trip to Torino. Once in that fabled city, one of Italy's best-kept secrets for history, architecture, great contemporary art and the capital of the increasingly influential Slow Food movement, we will spend an hour or so on an architectural walk in the company of a local historian. Dinner will be at Scannabué, located in the happening district of San Salvario, where it joins modish restaurants and bars that line the lively streets. The day begins with a visit to the world-renowned Egyptian Museum. Then, we will convene for lunch at Del Cambio, established in 1757 it is one of the oldest restaurants in the world. In 2014, it underwent a massive restoration by a team of 100 craftsmen and today features the dishes of chef Matteo Baronetto, who worked for nearly two decades under Milan-based chef Carlo Cracco. The Castello di Rivoli, a cutting-edge contemporary art museum that also features great medieval, Old Master and modern paintings. The building is a former royal residence of The House of Savoy, built in 1718, but its foundations date back to 1159, which makes the museum a must-visit for art lovers and history buffs alike. The Fondazione Sandretto Re Rebaudengo, established in 1995 by major art patron Patrizia Sandretto Re Rebaudengo. The foundation supports young Italian and international artists with particular focus on commissions and the production of new work. The museum space is one of the premier destinations to view experimental contemporary art in Torino. And, if we cannot take it all in, let's plan for another visit to this magnificent gem of an urban landscape! In the evening we will attend a performance at Teatro Regio, Teatro Carignano, or another cultural venue in this city of multiple temptations and perhaps have a late-night treat at Caffé Mulassano, an historic café in the heart of the city that will leave you with another unforgettable moment. After grabbing a morning pastry and a coffee at Al Bicerin, we will depart Torino by private car for Milan Malpensa and the journey home. This unique cafe, opened in 1763, is well known as a place where the most fashionable women of Torino enjoy a morning coffee after receiving communion at the Santuario della Consulata, the baroque church across the plaza. After arrival at Milan-Malpensa airport, our private car will take you to Villa Crespi on the shores of Lago Orta, just 45 minutes from the airport. To recover from the flight, there is time to check in and relax with a light lunch at La Motta, a trattoria on this beautiful lake. In the afternoon, we’ll explore the wines of this region that has been under-appreciated and overlooked for decades; it’s now the subject of rumors about the wonders of its “undiscovered” food and wine. We will visit Ghemme and the Rovellotti family discovering their complex and long-aged wines and the historic “ricetto,” a walled compound that served as a refuge for people of the area during times of strife and war. This 10th-century citadel of 12,000 square meters eventually evolved into a communal storehouse for the agricultural products native to the area — with most of the surface dedicated to wine. It is there that much of the work of producing the Rovellotti wines takes place. We will return to Villa Crespi and dine at its two-star table concluding the first day. Each of the journey’s repasts will survey exquisite local produce and traditional recipes of the region at a season when the palate of materials available to a chef is exceptionally rich. In the morning, we continue our exploration of Alto Piemonte with introductions to producers of other outstanding appellations in the zone. Its extensive vineyards were almost entirely abandoned during the course of the 20th century and are rebounding. Each of the great Nebbiolo-based wines of Lessona, Boca, Bramaterra, Gattinara, and more is produced by a Rosenthal Wine Merchant-selected small family estate. We’ll lunch on classic regional dishes at one of the fine local restaurants in Borgomanero or Romagnana Sesia. To maintain the relaxed but elegant ambience that is our aim throughout, we’ll spend the evening with Gianluca and Raffaella at their agriturismo, La Capuccina, a short drive from Crespi. Gianluca, Raffaella, and their team produce a cucina tipica based on the produce harvested and cheese made at their farm. Joining us will be one or more of the producers whose wines and food you have experienced during the day. We leave Villa Crespi and move west and north to the regions of the Canavese and the Valle d’Aosta. A particular delight of the day and the whole journey will be a tasting of a series of single-flower, vintage-specific honeys produced by Andrea Bianco in the village of Caluso in the foothills of the Alps. You’ll be immersed in the language of bees and experience a range of flavors scavenged from flowers as diverse as Acacia, Rhododendron, Chestnut, and more, an eye-opening realm that few people ever know. We’ll continue on to the village of Carema, the last town in the Piedmont before the Valle d’Aosta. Here one of the rarest of Nebbiolo wines is produced from a mere 15 hectares of vineyards dedicated to the Picoutener, the particular regional form of the grand Nebbiolo variety. A walk in steeply terraced vineyards in the shadow of Monte Bianco will precede a lunch at the exceptional table of Ramo Verde. We proceed north to some of the world’s highest-altitude vineyards. We’ll visit the salumificio of the Bertolin family for its versions of lard d’Arnad, boudin made from beet and potato, and aged teuton (sans description to preserve the secret recipe for the encounter on site). At the Grosjean estate in the steep hills above Aosta, as we taste wines from local grapes such as Fumin, Cornalin, Petite Arvine, and Petit Rouge, we’ll be educated in the cheeses from the magnificent mountainsides by Ed’s friend Andrea Barmaz of the Institut Agricole Régional. Sated, we settle into our cars for the quick trip to Torino where we’ll check into our hotel on the quiet, beautiful Piazza Carlina in the historic center of this elegant city. The day will close with a casual dinner at the famed Scannabué. After the wine and food indulgences of the week, we’ll turn to the the sophisticated, beautiful, historic city of Torino, the first capital of the Italian republic. Frequently overlooked by travelers, this magnificent city offers exceptional architecture in a refined, calm atmosphere. We will visit the Castello di Rivoli, a cutting-edge contemporary art museum that also features great medieval, Old Master, and modern paintings. The building is a former royal residence of the House of Savoy, built in 1718, but its foundations date back to 1159, which makes the museum a must-visit for art lovers and history buffs alike. We’ll program a guided tour of the architectural wonders of Torino or perhaps visit the Museo Egizio, which houses one of the world’s most formidable collections of Egyptian artifacts. Here, too, a private guide will help us understand the historical and artistic importance of what we see. For dinner, we’ll make the essential stop at the fabulous Del Cambio. Established in 1757, it is one of the oldest restaurants in the world and a cherished spot for the refined gentlemen and ladies of Torino. This beautiful restaurant captivates with its food as well as its unique decoration. Our friends there will treat us with special care; a visit to the deep cellar where a wealth of wines is stored may be the ideal way to end the evening. We move to the Langhe, home of Barolo, Barbaresco, and the white truffle. Our hotel may be either the luxurious Castello di Guarene, near Barbaresco, or the equally luxurious Relais Villa Amelia, on the outskirts of Barolo. On this day, we’ll taste with two fine producers in the heart of the Barbaresco zone: De Forville (with whom Neal has worked for 40 years) and Ada Nada (the newest of the Langhe producers to join the Rosenthal portfolio). Both estates work in the most traditional ways and will provide insight into time-tested methods for creating sublime Nebbiolo in hallowed terrain. Our friends at Ada Nada have arranged something almost no outsider ever experiences. A close family friend, a renowned truffle hunter, in league with his dog, will allow us into the secretive world of the truffle hunt, with its challenges and delights. At this time of year, when the grape harvest is over, the truffle is at the center of all activity in and around Alba. Our meals will be a series of risottos, pastas, and the like with generous shavings of that precious fungus. We’ll also be able to visit the Mulino Marino, where the finest corn for polenta is stone-ground, before we settle into our hotel and a feast that may well include that fabulous polenta and some of Piemonte’s majestic cheeses, such as the famed Castelmagno. We continue our deep dive into the Langhe with a day dedicated to a series of tastings and vineyard walks at several of Neal’s long-term suppliers in Barolo, including Cappellano, Brovia and the lovely Nicoletta Bocca of San Fereolo in Dogliani. As well, a tour of Alba and a visit to the Saturday morning truffle market, if possible, will highlight the day. Our taste buds will be further tested with a visit to a farm producer, chosen by Ed, who specializes in Murazzano, one of the most prestigious Piedmontese cheeses. We will dine in Bossolasco at Al Biancospino, where Danilo Allochis presides. A talented chef and gracious host, Danilo began his career of culinary wizardry in the Ligurian town of Alassio on the Mediterranean; that was followed by a multi-year stint in Brazil to further refine his techniques. The special meal he prepares for us will highlight local produce. If an early olive pressing allows, we’ll be joined by the Armato family of Alassio, bringing their brand-new, delicate Taggiasca oil. On our departure day, time and energy permitting, we’ll stop at Al Bicerin, the most unique café in town, which opened in 1763 and has been continually owned and operated by women. During its long history, it has become a fashionable spot for the ladies of Torino to take their morning coffee after receiving communion at the baroque Santuario della Consulata across the piazza. Then we’ll ferry the group to Malpensa for a return home or a departure for other adventures, depending on your personal desires and plans. €8750 per person based on double occupancy. Please inquire regarding single supplement. Please see Terms & Conditions for details. Strictly limited to 8 participants. The details of each of these itineraries will be available in the coming months. Please subscribe to the Mad Rose Journeys mailing list to be kept abreast of developments. Earth and sea, nebbiolo and vermentino, truffles and pesto – are just a few of the elements that mark this nexus of two regions renowned for the unique characteristics of cuisine and wine as well as for powerful historical and cultural exchanges. 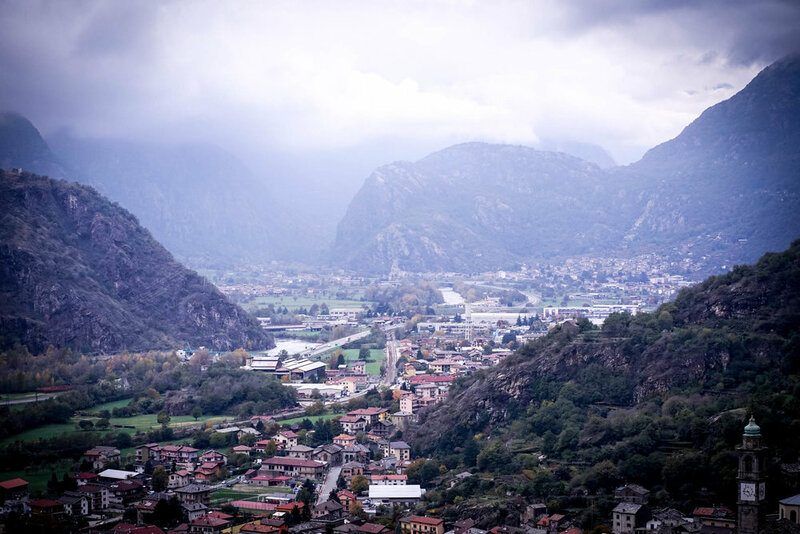 This journey visits famed wine producers like the Brovia family in the Barolo district and Piero “Bisson” Lugano, the creative genius behind “Abissi”, the underwater Spumante. The Armato family of Alassio will share their olive oils, breathtaking vistas of the Mediterranean will be seen, and meals will be eaten at sometimes secret tables served by remarkable local talents from the shores of Liguria to the hillsides of the Langhe. This extraordinary immersion into culture and history begins in Paris at Roger Beguinot’s five-star Narcisse Blanc and then moves to the Loire Valley and his Chateau Soucherie to explore the pleasures of Chenin Blanc in the terroirs of Savennieres and Coteaux du Layon-Chaume. The cities of Chartres and Bordeaux will add architecture, history and theatre with an immersion in the real and ancient wines of the storied appellations of the Medoc and the Right Bank as produced by the micro-estates in Neal’s portfolio. The romantic fishing village of Cassis backed by the soaring calanques jutting from the sea will be the starting point for this journey. Over the days you will know the historical wine-growing families of this region through visits to Chateau Simone, Chateau Pradeaux and the Chateau Peyrassol, home to a marvelous sculpture park. The fascinating city of Marseille and the university town of Aix-en-Provence will bring cultural activities and fine cuisine to tempt the most cultured among us. Home to understated luxury, true Italian artisanal craft, and thousands of years of history, Italy will reveal its finest during this weeklong extravaganza. Visits with the likes of the Bea family in Montefalco or with Luigi Anania of La Torre in Brunello, overnights in luxurious but unknown lodgings, and daily repasts of the varied cuisine of Italy awaits you throughout the region.